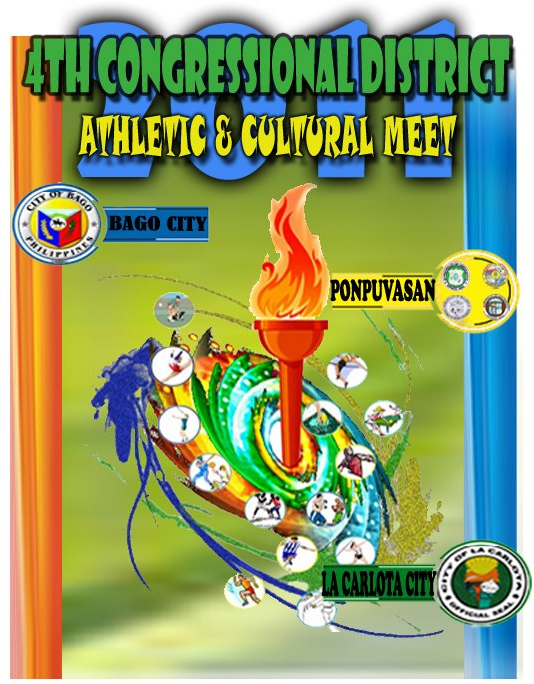 Tomorrow, Wednesday, November 9, all roads here in Negros Occidental PH especially in the 4th Congressional District lead to the humble city of La Carlota for the opening of the 4th congressional athletic and cultural meet. Athletic delegations coming from Bago City, PONPUVASAN (Pontevedra, Pulupandan, Valladolid, and San Enrique) and the host city, La Calota will converge at the oval of Doña Hortencia Salas Benedicto National High School for a 3-day sports competition. This annual sports competition among athletes within the fourth congressional district of Negros Occidental is focused on peace and solidarity through sports development. Negros Occidental governor Alfredo G. Marañon, Jr. commended the city of La Carlota for hosting this competition in a statement. He hoped that all athletes and sports officials will maintain good sportsmanship and teach each other with respect. 4th District Congressman Jeffrey P. Ferrer in another statement said that he was optimistic that this field of friendly competitions more materials will be discovered who can ably participate in future contests province-wide or in the national level. La Carlota Mayor Juliet Marie D. Ferrer hoped that this would be an opportunity for the La Carloteños to share with the different athletic contingents the hospitality of the city. Bago City Mayor Ramon D. Torres: "This activity is your opportunity to showcase your God-given talents honed by years of training and guidance by your mentors and coaches." Pulupandan municipal mayor Magdaleno M. Peña: "This occasion will surely mark another opportunity to enhance fellowship among students of different schools as well as create a venue where they shall see the value of sportsmanship, discipline, and hard work." Abner D. Jardenico, acting municipal mayor of San Enrique: "This Area Meet, where the spirit of sportsmanship, brotherhood, and camaraderie is experienced." Jose Maria A. Alonso, municipal mayor of Pontevedra: "This is a friendly competition of peers with a common cause: the betterment and development of the District." Romel P. Yogore, municipal mayor of Valladolid: "Let us strive to achieve our goals, our feelings being mutual, and perfectly in agreement with one another." "an awareness how learning communities work for peace and solidarity... value-laden and infotainment," said Juliet A. Jeruta, Schools Division Superintendent of La Carlota City, the host city. "enjoyment to the public, fulfillment to the athletes and more inspiration and motivation to the teachers, school and local government officials... for the good of the larger community and society as a whole," expressed Milagros S. Gonzales, SDS of Bago City. "Our youth will be able to imbibe them [the ancient landmarks of honesty, justice, dignity and discipline] and make them their own standards as they face their personal fight against the oddities of life," added Rizalino S. Tortosa, SDS of Negros Occidental. On the other hand, La Carlota Assistant Schools Division Superintendent Ferdinand S. Sy stressed the intellectual and physical strength of an athlete: "Mens sana est[sic] corpore sano" [A sound mind in a sound body] is important in the world of sports. While Portia M. Mallorca of Bago City emphasized that the greatest honor at stake is how to acknowledge success with humility and accept defeat with dignity. Let there peace and solidarity in sports development! what a great blog post about the sports competition in La Carlota. Our daughter, Sister Sanchez just arrived this week in your wonderful city to serve as a missionary. Our family is from Gilbert, Arizona USA and we are so thrilled that Sister Sanchez will be serving in La Carlota. Perhaps you will have a chance to meet her sometime. We know she will love it there. I can see by the pictures that it is beautiful and I am sure the people are wonderful. You have an excellent blog. I hope you dont mind that I follow your posts? We love to read and see all me can of your amazing country and people. Congratulations on your blog award. It is very well done and so informative. So many good features and information. Our daughter said in her letter that she really enjoyed meeting you and was so surprised by the things that you knew about her. That was great! I will stay in touch with your blog and enjoy it very much. Thank you and congratulations again. Thanks. I'm honestly elated of your generous praises about my blog. I will maintain it so that your impression won't be changed. And you'll always following it up for further information and even strengthen our friendship. Yes, that's very true. Your daughter was surprised why I knew more about her since it was our first meeting. As a person who is genuinely interested with and very loyal, he'll do his very best to know about his fellow. And that's what I did. Thanks again. Please support my blog. Hope this happens in the national level! I am so glad that your governor was able to support the sports events in your place. Indeed it is a good project especially to the youth of Negros! I am not really into sports. But I do know it plays an important role in building us up not only physically, but also socially. this is really nice, especially if the youths are involve... as a parent, i'm more comfortable if my kids are joining competitions like this... a good diversion from the bad elements... more power to the organizers... Yahweh bless. Involving the youth on sports is another way to instill in them the moral values in order for them to grow as productive individuals in our society. Though I am not really into sports that is why I make use of music as a way to promote Filipino values within our community. Hi there! What a great way to build up the younger generations of today-through sports. I hope we have that same agenda here in our place. sports instill the values of sportsmanship among players...nice project for the youth! "Let there peace and solidarity in sports development!" True! Peaceful sports for me can also a great factor in building a better and peaceful country. It's good to know that your province has this kind of activity every December. This will hone the skills and talents of Ilonggos in terms of sports. Given the fact that Ilonggos are good at sports, I know this activity will help them a lot. Proud gid ako nga ilonggo man ako ah. It's a great project. It's a good factor in building individual character and also in learning to work with a team. Hope this is a huge success! Good luck! It is so nice to know that the local government official supports sports development in your province. Not all local official do that. with your RSS. I don't know the reason why I cannot join it.